Manufacturer & Exporter of Display Panel & Display Panel Equipment. Our product range also comprises of Pinch Valve, Pneumatic Pinch Valve and Gear Operated Pinch Valve. Vertex Display Panel is 1M wide and 2M high. 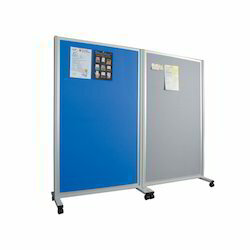 Further panel of 1M width can be added on either side of any individual panel. Each panel comes with laminated top at bottom with stand. Vertex Display Panel frame and accessories are powder coated in black color, and for perforated panels you can choose from our standard colors.